Thursday, we have the Tower. With the Moon is in Leo, it could be something dramatic. You may realize things that don’t work for you anymore and decide to change or do something about them. These could be attitudes, behaviors, or items you’ve never used or outgrown. 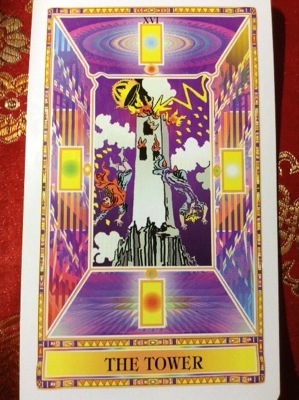 Spring cleaning tends to occur sometime in March and goes well with the Tower card. The Tower card could describe a person getting rid of junk in their house. Are you thinking about doing a Spring cleaning of some sort? February 14 is Valentine’s Day and the last day of Chinese New Year celebration. There is also a Full Moon in Leo. 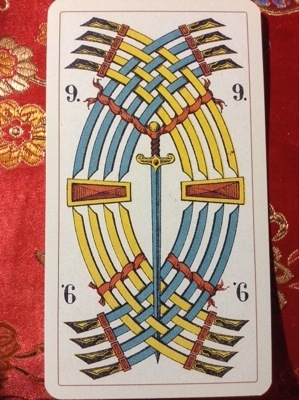 Today, we have 9 of Swords, which is usually associated with worry, mental clutter, and nightmares. What does this card have to do with full moons? A Full Moon gives heightened energy. It tends to be more chaotic during a full moon in general. The energy affects people. Add in Leo (drama). Are the scenarios a person manufactures in their head not dramatic? How many times has something turned out less dramatically and better than you imagined? Now that you understand this potent energy, you can use it to your benefit. This is highly creative energy which can be used for good or ill.
What was your experience with the Full Moon in Leo?